October 1917, the New Zealand Division was ready for their first assault as part of the Third Battle of Ypres. This is where the New Zealanders launched their attack on Gravenstafel ridge on 4 October 1917, in the lead-up to Passchendaele. The area where you are now standing is known as Dochy Farm Cemetery. This is where on 4 October 1917, the New Zealand Division became involved in the 3rd Battle of Ypres. This would force the Germans to withdraw some ten to 15 kilometers. About 50 metres across the road in front of you was the general area of the British front line. If you look down this farm track up onto the high ground, to the immediate left, you can make out a white memorial. That’s the New Zealand memorial, named Gravenstafel after the first battle that took place here on 4 October. 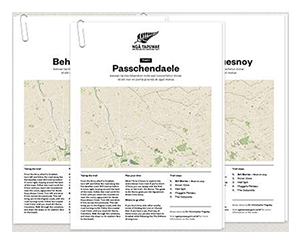 Gravenstafel ridge was the first New Zealand objective, and it was part of a strong German defensive position. A position that had to be taken. Imagine the landscape in front of you. It was a sea of craters, all of the trees were shattered, and just their stumps left, farm houses were destroyed into piles of rubble, all you could see was bunkers and barbed wire dotting the landscape. One of the key differences to this battle is that the Germans had changed their defensive tactics. It wasn’t just trench-to-trench fighting anymore. Because of the innovative infantry and artillery tactics of the Allies, the Germans had been forced to develop new techniques to defend their positions. This involved the building of reinforced concrete bunkers known as pillboxes, positioned to create killing zones - hemmed in by barbed wire. Some of the bunkers were originally cellars from farm houses that had been further fortified. These pillboxes housed machine-gun teams and snipers, and were ringed with thick barbed wire entanglements, creating interlocking fields of fire that were devastating to the approaching enemy. All of this was backed up by machine gun teams in nearby bomb craters and Eingreif or ‘counter-attack’ infantry further behind them, waiting for the right moment to tip the balance. This impressive defence system was further bolstered by German artillery which would provide extra killing power during an attack by shelling the British infantry. To take these positions - infantry would attack each pillbox and bunker with small teams of men equipped with Lewis guns, Mills bombs, rifle grenades, rifle and bayonet. Once taken, they could use these defenses as shelter from German counter-fire or attacks. The New Zealanders had trained for weeks and weeks on their tactics for this battle. On the evening of the 3rd, the New Zealanders assembled - where you stand. 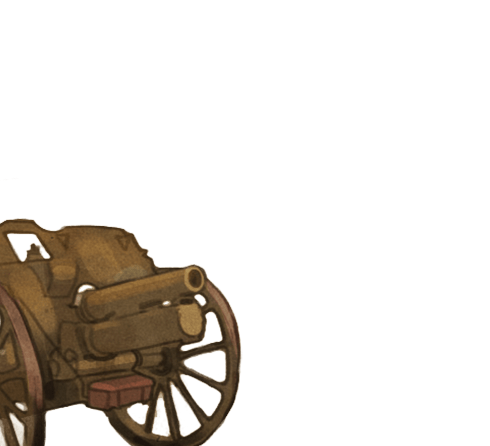 Around 6.00a.m., on a dark and misty morning on 4 October - the Allied artillery barrage began - and crept up the slope - in front of you. The New Zealanders advanced, slowly making their way through the craters, in every crater were dead Germans caught in the open by the barrage. They attacked the pillboxes and bunkers in-turn, successfully taking each one and forcing the surrender of the Germans defending them. Those who didn’t immediately give up were shot, grenaded, or - if lucky - taken prisoner. The 3rd Otagos captured Gravenstafel, taking around 100 prisoners. Meanwhile, on the ridge, further to your left, the two front battalions, the 1st Aucklands and the 1st Wellingtons, had become separated. The Aucklands were drawn away to the far left because of the terrain and the German pillboxes - while the Wellingtons were grappling with the Germans at a bunker complex called Korek which is just to the left of the memorial - this caused a gap in their line - despite this, they fought their way forward. The attack was an outstanding success and warning signal for the Germans - that their new defensive tactics were vulnerable. Around 5,000 prisoners were taken, with the New Zealand Division alone taking over 1,100 - and Gravenstafel Ridge was now in Allied hands - leaving one more ridge to go before Passchendaele. Tip: Make sure you bring a pair of headphones to hear the audio clearly as background noise can be a nuisance. Drive out of the Lille Gate (Rijselpoort) at the roundabout, take the third exit onto the N37. At the next roundabout, continue straight on the N37. At the roundabout (Hellfire Corner), take the third exit and stay on the N37. Continue to follow the N37 for about 6km to Zonnebeke. At the roundabout, take the second exit onto Langemarkstraat. Continue onto Zonnebekestraat and park at Dochy Farm cemetery on your left. Enter the cemetery, turn right and walk to the corner. Face away from the cemetery, looking across the road. The New Zealand attack at Passchendaele (Passendale), part of the Third Battle of Ypres in 1917, showing the advances on 4 and 12 October. National Army Museum, NZ. Accession No. 1990.1714.1. Drive out of the Lille Gate (Rijselpoort) at the roundabout, take the third exit onto the N37. At the next roundabout, continue straight on the N37. At the roundabout (Hellfire Corner), take the third exit and stay on the N37. Continue to follow the N37 for about 6km to Zonnebeke. At the roundabout, take the second exit onto Langemarkstraat. 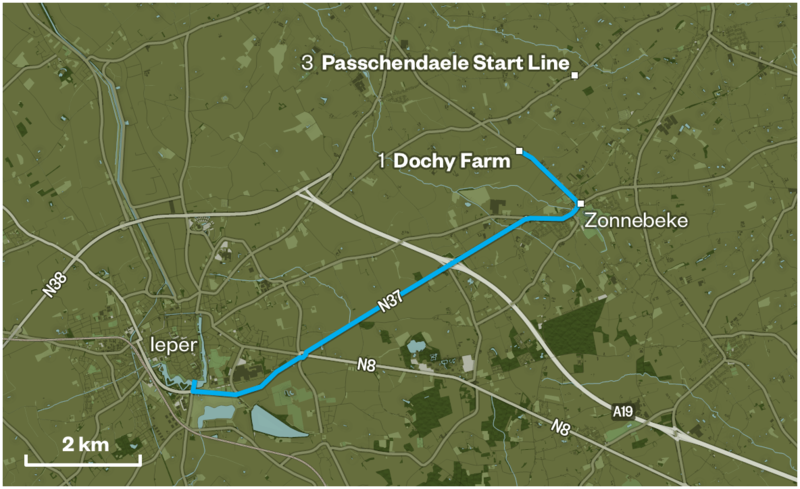 Continue onto Zonnebekestraat and park at Dochy Farm cemetery on your left. Drive out of the Lille Gate (Rijselpoort) on Rijselstraat N336. At the roundabout, take the third exit onto the N37. At the next roundabout, continue straight on the N37. At the roundabout (Hellfire Corner), take the third exit and stay on the N37. Continue to follow the N37 for about 6km to Zonnebeke. At the roundabout, take the second exit onto Langemarkstraat. Continue onto Zonnebekestraat. Turn right onto Roeselarestraat. Continue along Roeselarestraat, past the New Zealand Memorial on the left, onto ‘s Graventafelstraat (approximately 2km). Park in the Cheese Factory (De Oude Kaasmakerij) car park. Walk to the left corner of the car park, stand in front of the Ngā Tapuwae sign facing away from the Cheese Factory/De Oude Kaasmakerij towards Passendale. 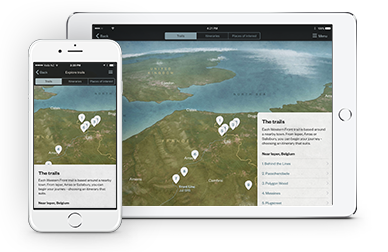 Allow for 2 to 4 hours to explore the complete Passchendaele trail. If you’re short of time, simply visit stop 3: Passchendaele Start Line for an overview of the entire Passchendaele trail. Tyne Cot is the largest Commonwealth military cemetery in the world.